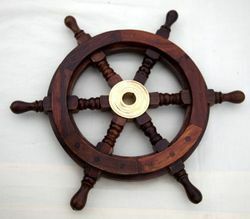 Wall Hanging Home Decor Wooden Ship Wheel. 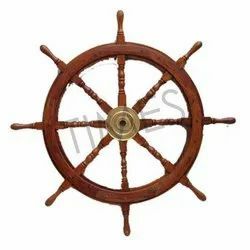 Being a leading enterprise of this industry, we are offering a huge range of Ship Wheel. Clients can avail from us an astonishing range of SW – 2491226. These products are used to turn any room, cabin, deck, patio or garden into your own nautical wonderland. Our product range is appreciated for its quality standards and longer service life. Clients can avail these products at market leading prices. We have in store for our clients a highly attractive and flawless crafted range of sailor wheels. Manufactured using quality wood, these sailor wheels are extensively popular as show pieces for display in homes, restaurants & offices. The old world charm of these sailor wheels and the aesthetic design makes these one of the most popular items in our collection. It is made of solid wood.